The Scottish FA is in negotiations with its English counterpart over a potential friendly later this year. 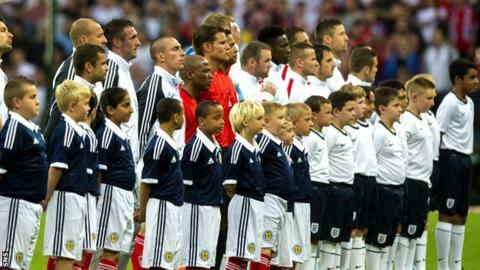 England hosted and beat Scotland in August as part of the Football Association's 150th anniversary celebrations. Both nations are set to start their Euro 2016 qualifiers in September. Next month, World Cup-bound England host Peru in a friendly while Scotland will play Nigeria at Fulham's Craven Cottage. Roy Hodgson's side will then take on Ecuador and Honduras as part of their preparations for Brazil 2014, with the first group fixture against Italy on 14 June. The most likely date on the international calendar for the proposed friendly is 18 November. Hampden Park will need refitting after hosting the athletics for the Commonwealth Games, with Celtic Park the biggest alternative venue in Glasgow if the work is not complete. Scotland's 3-2 defeat by England last year was the first meeting of the two sides since 1999, with more than 20,000 Scottish fans in a crowd of 80,435 at Wembley.